I thought it looked like something called "Chicken of the Woods" so I did a little research and sure enough. 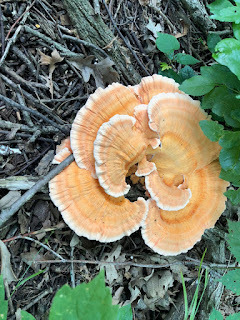 It's an edible mushroom that literally tastes like very flavorful chicken. I just fried up and sampled a tiny bit (advised by a site that said a small percentage of people don't tolerate these well) and it's DELICIOUS. Thinking I'm going to harvest these and cook some up and enjoy with a great Italian beer I found at the local liquor store in Spicer that seems like it would be the perfect complement. I'll keep you posted.